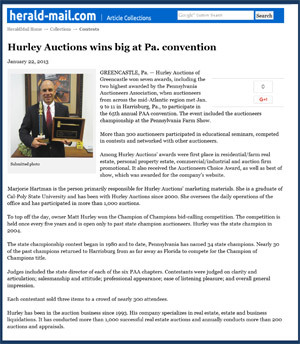 Our award winning team has brought Hurley Auctions to the forefront of the auction community. 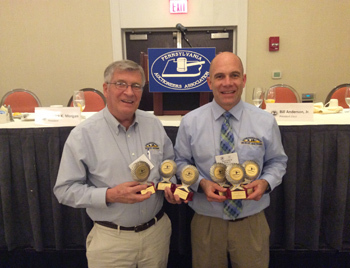 Recognition from the peers in our industry at the state and national level is very gratifying. It signifies that you are in the best of hands when you come to Hurley Auctions. In the end, after we place these trophies and plaques on the walls and shelves in our office, we start earning them all over again, one client at a time. Your success story is our greatest reward and we are in business to make you the winner. 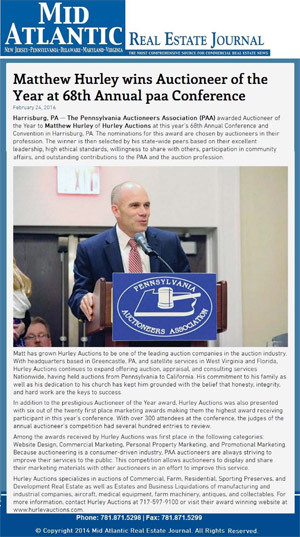 2016 Auctioneer of the Year for the state of Pennsylvania awarded to Matthew Hurley. He has also received the title of Pennsylvania State Champion Auctioneer as well as the highest honor awarded to bid callers in Pennsylvania "Champion of Champions". Click on an article below to view it. 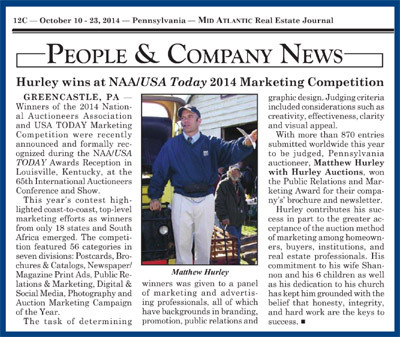 PAA 2014 ADVERTISING/MARKETING CONTEST – One or Two Color: Personal Property/Estate (no RE). Internally Produced.